MAC's Sumo Sale. 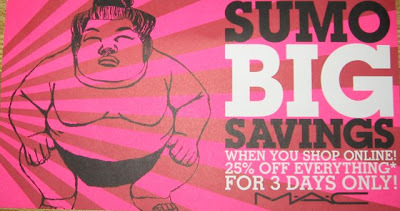 Summer + Big Savings = Sumo. We've covered Mac on the blog before - but not this kind of MAC. :) We're proud to first cover the elite cosmetics brand around the launch of their new bee-related product line, Naked Honey. Plus, honestly, we're blown away seeing MAC launch such a great coupon! I mean, SUMO 25% off? Sweet. We at Qmania are into saving the world money. If you're a business owner, learn how Qmania can save you dollars. See deals on Qmania now.